* Remains flexible at low temperatures; won t flow at high temperatures. * Won t get hard and crack with age. * Exhibits good adhesion to aluminum, tin, corrugated steel, concrete, urethane foam, asphalt roofing. * Highly compatible with E.P.D.M. and other rubber roofs. * Provides long-lasting waterproofing in all climatic extremes. CRS is a single component urethane, modified with Micaceous Iron Oxide flakes and fire retardant chemicals. It is especially designed as a waterproofing membrane for all kinds of roofing. CRS is tough and elastic with a high tensile strength and good puncture resistance, and contains corrosion-inhibiting pigments for protection against rust and acid rain. Caution! READ THIS ENTIRE PRODUCT DATA SHEET BEFORE CONTINUING. Surfaces must be dry and free of dirt, loose debris, oils, grease or any substance that could interfere with adhesion. Refer to the data sheet for information regarding selection of appropriate primer if necessary. Application over seams in metal roofs is achieved by embedding 4" or 6" wide Calfab into a fresh coat of CALBAR ROOF SEAL (CRS) applied at 15 mils wet thickness. The fabric is then saturated with a second application at sufficient thickness to remove all voids, fisheyes and dry spots. Bolt-heads on metal roofs should be daubed with sufficient CRS that they are encapsulated to the point of rundown. 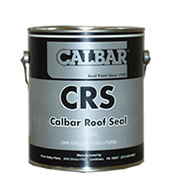 As soon as the CRS has dried, it may be coated with CRS or other compatible topcoat. Application over E.P.D.M. modified and other rubber roofs requires the preparation detailed above along with reinforcement of seams. Some rubbers will swell slightly immediately upon application. This is normal. The adhesion process is complete when the original dimensions have returned. New urethane foam should receive 2 coats of CRS at 15 mils wet thickness per coat to be sure that no foam is exposed to pinholes or holidays. For sealing a metal roof in areas such as seams, fasteners, flashing and 'rust through'. Use in conjunction with Cal-Fab Polyester Mesh. CRS is also an excellent rust inhibitive primer. © PennValley Paint, Inc. All rights reserved.